Mix both, press the mixture firmly over base of a dish or individual glasses and refrigerate. Beat together and pour over biscuit base and set in fridge. 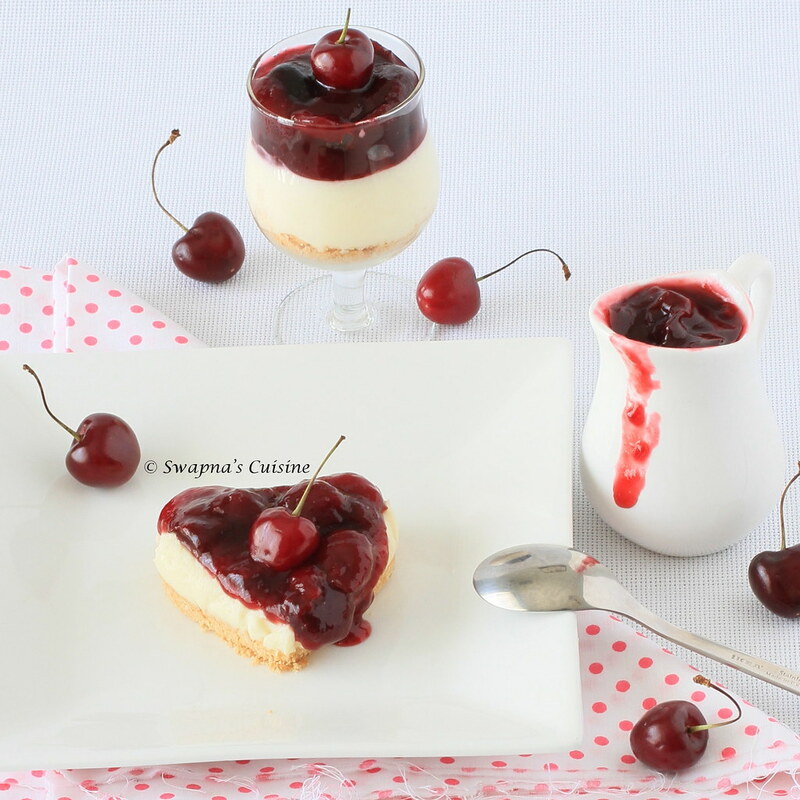 In a large saucepan toss together the cherries, sugar, cornstarch and salt. Allow it to sit for about 30minutes to allow the sugar to draw out the juice. Cook over moderate heat, stirring constantly, until thickened and boiling. Simmer 1 minute. The mixture should just barely drop from a spoon. Remove from heat and stir in almond essence. Cool and spoon over cold cheesecake. 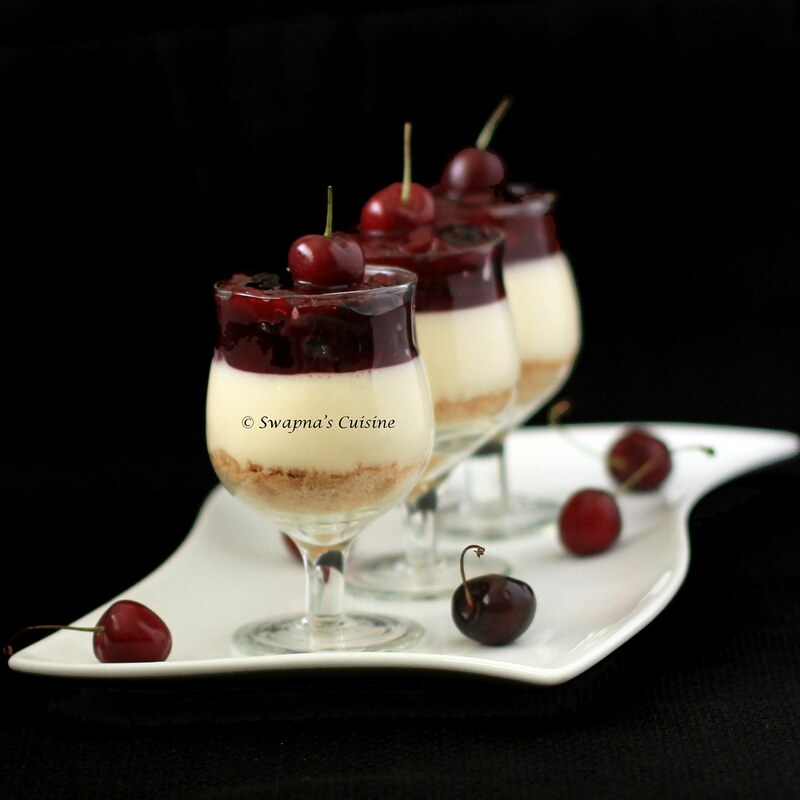 Serve decorated with fresh cherries. Deseed the cherries. Take 1/2 & beat in mixie, use syrup and thicken with cornflour and sugar to sauce consistency. Cool. 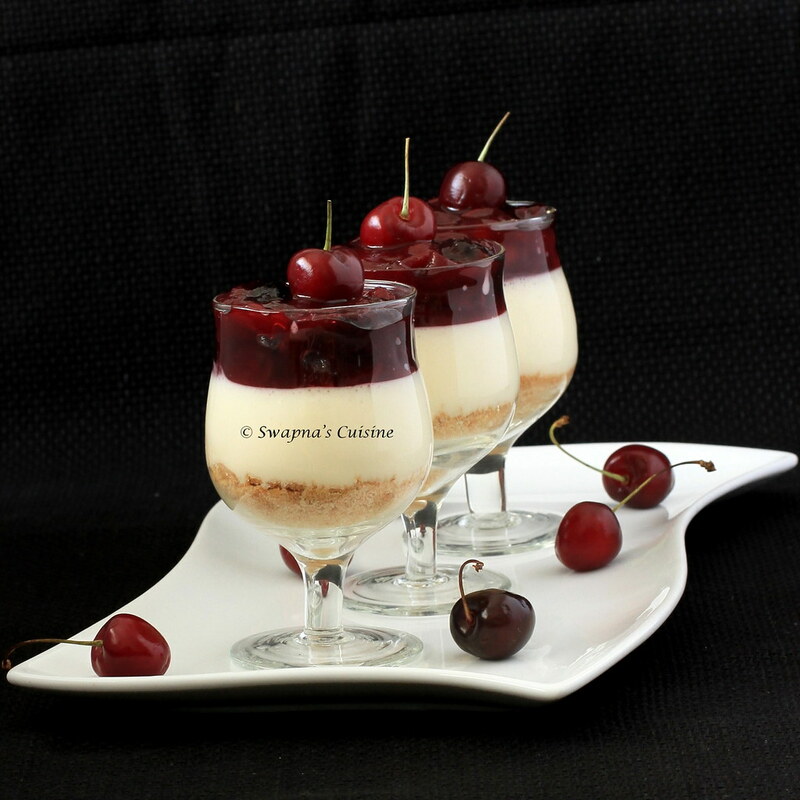 Pour over set cheesecake & top with remaining cherries. Such an elegant and irresistible cheesecake. Loved recipe + amazing colour n pic, Swapna! True, this season cherries are amazing! instead of cherries (considering the fact that its a bit difficult to get in India :)) is there any other fruit topping that i can make? Also is the process the same? Updated the post.. please check.. It looks delicious, Chechy! Wishing you both many many years together! Congrats! The dessert looks perfect. Wow lovely...... Btw one doubt....how many servings does this give ? Superb. Love the picture with the slice on the plate and the sauce dripping over. Irresistible. Was thinking just today but trying out a cheesecake recipe....yours sounds just toooo good to resist!! This is so pretty! Sour cherries would work so great here, too. I'm so impressed with your blog and the receipes posted. Do you take cooking classes in KWT, if so pls let me hv yr phone no in order to get in touch with u. Is gelatin necessary to make the creame base? Can I do it without the Gelatin? The receipe uses Gelatin, Can I make the cheese base without gelatin ? Is china grass and agar agar the same?